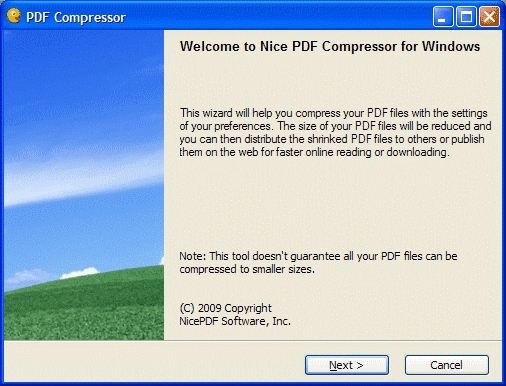 Compress PDF file and reduce the actual size of PDF document with this PDF Compressor.Nice PDF Compressor removes duplicate PDF objects optionally takes advantage of new compression features of latest PDF specifications that for many classes of documents compresses 30 - 60% better than what is possible in PDF 1.5.Nice PDF Compressor allows you to shrink PDF file by using Flate or RunLength compression algorithm. With this software you are able to set the compression level to generate PDF files of the smallest size.Another benefit of this software utility is batch conversion you can compress all PDF files in any folder in batch. 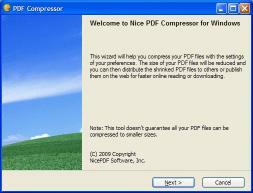 You can also decompress PDF files and restore to their actual sizes.